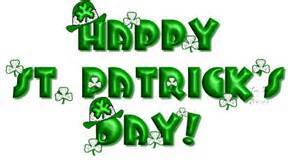 How many of you celebrate St Patrick's Day? Are you wearing green today? Making a St Patty's Day supper? I know we all try to wear a bit of green on the day, or dress or children for school in green. I remember mine when they were younger, and I would ask them, who forgot in your class to wear green today? I think they were happy that mom had remembered and they were "cool" that day cause they did! Gerry has an office job and I've still carried on that "mom" style when he'll go to work on a weekday- telling him to wear his green shirt! I would have made the traditional St Patrick's Day meal with corned beef, cabbage, etc., but it's just not my dish, so I'm passing on that one today. P.S Next Friday we leave for our trip to Memphis! !